Three institutions of higher education in Leipzig; HHL, HTWK (University of Applied Sciences) and Leipzig University, share a common goal with the Minister President of Saxony: they want to bring the location of Leipzig to the forefront in the field of digitalization. 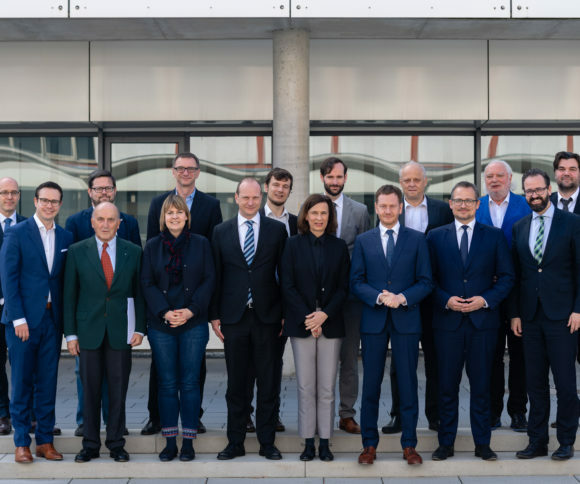 How one can present the competencies existing at these educational institutions so that small enterprises and the region of Leipzig can also utilize digitalization was discussed amongst Minister President Kretschmer and representatives from politics, the economy, the schools and the city of Leipzig. “Every school for higher education has its own skill set in the field of digitalization. We want to bring everything together on this wonderfully placed, scientific and commercial location of Leipzig to work out what great opportunities for all participants lie in digital transfer,” said HHL’s Dean, Prof. Stephan Stubner. Minister President Kretschmer emphasized how important it is to give competent assistance to businesses so that they will profit from the use of artificial intelligence; for example, through the operation of self-adaptive machinery. From industry, the need to train more commercial computer scientists was expressed. This could be accomplished through business managers learning to program or, just as appropriately, programmers becoming knowledgeable in business administration. With the strong higher-educational landscape, the overall attractiveness of the city, the startup-friendly atmosphere through such opportunities as SpinLab – The HHL Accelerator as well as the centrally and logistically well-connected location, Leipzig has – and the participants were unanimous on this point – the best possible conditions to become a central location for digital enterprises.